Adam Smith is well recognized as the forefather of modern economics, but his success can be attributed not only to what he wrote but also to his use of language. 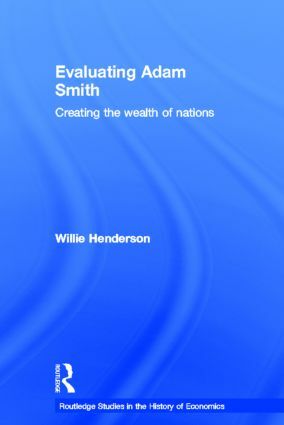 In this exciting new book, Willie Henderson shows how Smith engaged creatively in writing about the economy, and analyzes the extent to which he tried to ensure that the reader is drawn into the text and informed by it. Demonstrating analysis methods that are helpful to new researchers on Smith’s works, Evaluating Adam Smith sets his work in the cultural context of the eighteenth century and explores the lexical and conceptual inter-relations between Smith and the sources he consulted. Issues explored include Smith’s use of irony and his work in the context of wealth, virtue and happiness as presented in the Moral Sentiments and the Wealth of Nations. Henderson’s informative study employs the literary techniques of close reading and close textual analysis and applies them to sustained passages of Smith’s writing. Willie Henderson is Professor of continuing education/director, centre for lifelong learning at the University of Birmingham, UK.